Are you a cycling enthusiast! Do you love riding through rough terrains? Does the idea of cycling through Himalayas from Manali to Leh make you jump on your feet? We at GozoCabs get really excited when someone mentions the Himalayas. It is our favorite destination when it comes to adventure and fun loving trips or sometimes just peace and serenity. That’s why we are constantly building up our services in the region. We want to share our love for Himalayas with everyone! 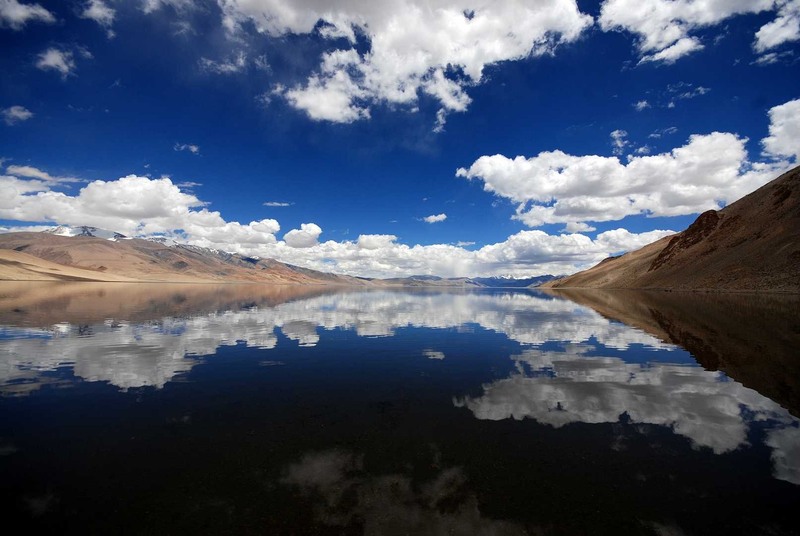 Introducing the Manali – Leh Highway! One of the most exhilarating mountain terrain you will ever come across! This miles after miles of adrenaline pumping scenic beauty is one-size-fits-all destination for mountaineers, photographers, cyclists, spiritualists, music festivals lovers, road trippers. Carved through the Himalaya mountain range in 1987 and opened to foreign travelers in 1989, the 500km highway between the towns of Manali and Leh in northwest India has become a premier mountain challenge for intrepid cyclists, presenting one of the highest and most starkly beautiful rides in the world. Blanketed by snow for most of the year, the road is accessible for just three or four months – around June to September – when makeshift villages, such as the prayer flag-strung Marhi, 50km north of Manali, materialise. So take this summer vacation to a whole new meaning of life, adventure and adrenaline rush of cycling through Himalayan serenity. Book a one way cab from Delhi to Manali with GozoCabs and begin the most memorable journey of your life. There are multiple tour operators in Manali which provide you with package deals for cycling tours of 12 to 16 days. Let us know if you would like us to help you on that. We would love to hear about your journey through the Himalayas once you are back. Live on the Edge! We also provide cabs from Delhi to Shimla, Chandigarh to Shimla, Chandigarh to Manali and we are regularly adding many more destinations to the list. Follow us on Facebook and Twitter and keep updated with our discounts and offers. Buses/ Cabs: Cabs to Manali are available throughout the year. The approximate time taken from Delhi to Manali is 10 hours and can be reached by NH 1 up to Chandigarh and from there by national highway NH21 that passes through Bilaspur, Sundernagar, Mandi and Kullu towns. The road distance from Delhi to Manali is 550 km and from Chandigarh to Manali is 273 km. The roads are well paved and the route is beautiful. Buses from Delhi to Manali start from ISBT Terminus and buses from Chandigarh to Manali start from Sector 17. Buses to Manali from other cities like Dehradun, Patiala, Meerut also run. To book cabs to Manali from Delhi kindly contact us at www.gozocabs.com. We also provide cabs from Chandigarh to Manali. Trains: Trains from Delhi to Manali are non-existent currently. Since the terrain is hilly, the farthest that you can go to is Joginder Nagar which is 135 km from Manali. Other nearby destinations includes Chandigarh, Pathankot and Kalka. Beyond this point, one would need to book a cab to Manali. En route to Manali, cabs for Shimla can be booked, a stay can be planned for a day and then an onward journey can be taken. Flight: The nearest airport (IATA code KUU) is at Bhuntar town, situated on NH21 about 50 km south of Manali and 10 km south of Kullu town. The airport is also known as Kullu-Manali airport. Indian Airlines and some private airlines have regular flights to the airport. Daily flight service (except Tuesdays) has been started by Air India from Delhi to Bhunter and vice-versa since May 2013. After reaching Delhi airport, taxis/ cabs to Manali need to be taken. Generally international tourists come for adventure sports in Manali and its pleasant weather in the months of April-July. There are plenty of (more than 500) guest houses, lodges, rest houses and hotels in Manali. You can either book a place before hand, but in case you have an ad-hoc plan, there will always be a room waiting for you irrespective of the season. You can go through several web links including the one below to know more: http://www.tripadvisor.in/Hotels-g297618-Manali_Himachal_Pradesh-Hotels.html. A personal suggestion: A trip to Manali is never complete without a good hotel. Budget hotels in Manali charging in the range of INR 700-1,000 per night include Apple Paradise, Hotel President, Pine Grove, Manali Majestic, Rising Star, Hotel Hadimba Way and Hotel Kalpana. The mid-range hotels in Manali are Hotel Snow Line, The Manali Lodge, Khushboo Resorts, Hotel Snow Park and Manali Heights. And names of some of the exotic hotels are Manu Allaya, Banon Resorts Manali, Hotel Sandhya Manali, De Vivendi Resorts and Span Resort & Spa. With no dearth of good hotels in Manali, you can plan a trip here at any time during the year. Places to visit in Manali! Solang Valley: A valley perennially covered with snow, this is the premier destination visited by tourists. With its fine ski slopes and snow clad terrain, paragliding and skiing is done here. Snowfall in this valley is perennial. Additionally, paragliding can be done here! Do not book a skiing jersey beforehand since you’ll be charged a bomb. Go to the valley and get your skiing gear there itself! Rohtang Pass: The most famous place around Manali it is a significant landmark in the Indian landscape; special cabs from Manali to Rohtang go during the periods in which the pass is open which is typically May-August. Gozocabs provide cabs to Rohtang Pass from Manali during these months. Jagatsukh: Situated on the left bank, it is famous for the historical interesting Sharvali Devi temple. Tibetan Monasteries: There are 3 newly constructed colourful monasteries in Manali offering a wide range of handicrafts and carpets. Travel to Manali is incomplete without visiting this place. Vashisht Hot Water Springs: Renowned for its natural hot water spring with temperature reaching as high as 100°C; there are temples dedicated to Vashist Muni and Lord Ram in the vicinity as well. Visiting Manali excluding the hot springs is unacceptable. Mountaineering Institute: The institute organizes basic and advance training courses in trekking, mountaineering, skiing and water sports and is often a place thronged by tourists in huge numbers. Rafting: White Water Rafting is done in the Kullu valley along the banks of the Beas river from Pirdi to Jhiri on a track of about 16 km in length. Canoeing and kayaking too is also done! Zorbing Ball: One of the very few places in India where this is done, it’s an awesome sports activity. This is the main adventure sport here and is unique to the place. Skiing: Skiing courses and competitions are held every year at Solang Nala. The best slopes include Bhrigu peaks near Hamta. A little bit of summer skiing can be done even on the Rohtang pass. Trekking: Dhauladhar and Pir Panjal ranges easily accesible from Kullu valley are the premier trekking spots. Other areas include treks to Lahaul & Spiti, Zanskar, Kinnaur and Kangra. Snowfall in Manali is a facet you need to be weary off. Else, the trek is amazing. Doongri Forest Festival: Organized by the women folks of this place, this is a major event of this place in which sweets and cuisines specific to Manali are made to the forests. Special tourist cabs to Manali are available during the festival months. Winter Carnival: Among all the Manali Tourist actvities, Manali Winter activities are a big hit amongst the tourists visiting Manali. Skiing competitions are organized in Manali during the winters every year. Athletes and tourists from all across the globe come over to this place to be a part of this event. Along with the snow in Manali, this forms a treat to the eyes of the beholders. Cabs to Manali from Delhi and Chandigarh are available in these months at special discounts. A trip to Manali should be planned during this time which would be the ideal time and ideal season to visit the place. Kulu shawls are the highlight of the place. Kinnauri shawls, mufflers, Pangwali blankets from Chamba and multi-coloured hand-knitted woolen socks from Lahaul are the authentic apparels that one should buy in Manali. There is good range of thangkas, silver and turquoise jewellery available in the Tibetan market. Tibetan handicrafts including curios, antiques and knickknacks are also items to be added on your shopping cart. There are wide range of locally made pickles, jams and juices. Natural oil like apricot oil for massages and shampoos are available in the shops on the mall. Coming all the way from Delhi to Manali would mean that one should get a souvenir from this beautiful place. The best season to visit Manali is after the retreating monsoon during December-February. However, even during the other seasons the place remains pretty cold. The average temperature in Manali is around 15 degrees. Being one of the premier hill stations in India, it has tourists all throughout the year. A breakaway during the summer months would be advisable. Snowfall in Manali is also a must watch and the month of December is ideal for it. However, the best season for enjoying an escape from the mundane city life is summer from April-June. The stay at Manali depends on how much time you have allocated for your vacations. It is suggested that you plan a trip of 4 days from Delhi to Manali and back. You can stay in Manali for 2 days and while returning halt at Shmila or Kulu. Nearby places like Mandi and Kangra are also delightful hill stations. The optimistic estimate to place for a 4 day journey would be INR 8,000 per person. It would be advisable to hire a cab for Manali, use the same to roam around the place for a couple of days and return in the same. e second destination of our ‘Weekend Quickie Campaign’ is Jim Corbett National Park, the oldest National Park in India which is located in Nainital district of Uttarakhand. The favourite destination for tourists and wildlife lovers it is home to over 400 different species of flora and over 550 different species of fauna. It was established in 1936 to protect the Bengal Tiger, a critically endangered species. The town of Ramnagar is the headquarters of the Corbett Tiger Reserve. Apart from this species, Leopards, Asiatic Elephants and Spotted Deer are the other star attractions of the park which spans over a massive area of 520 sq. km. One of the best weekend getaway spots for nature lovers, there are around 1 lakh tourists who come to this place annually! It is well connected by road to major towns and lies on the NH 121 highway. Buses, taxis and cabs to Jim Corbett National Park are available aplenty. Trains: There are overnight trains available from Delhi, Lucknow, Kanpur, Agra and Varanasi to Ramnagar. The railway station is located at a distance of 12 km from the main city. Ranikhet Express takes you from Old Delhi to Ramnagar in 6 hours and Kumaon Express is a daily train from Agra to Ramnagar. Buses: Buses from New Delhi to Jim Corbett run at a frequency of half hour. They will take you to the Ramnagar Bus Terminus, which is around 8 km from the national park. Delhi Transport Corporation runs a semi deluxe service which takes you directly to Ramnagar. There is another route via Haldwani and Nainital from where there are bus services are available. Uttarakhand State Transportation also runs buses to Jim Corbett National Park. Flight: The closest domestic airport to Corbett National Park is 50 km away from Jim Corbett National Park at Phoolbagh, Pantnagar. Domestic tourists may land at the Delhi or Dehradun Airport from where the connectivity to Jim Corbett is good. For international tourists, the best option would be to land at the Indira Gandhi International Airport, New Delhi and take a cab to Jim Corbett. A number of guest houses, resorts, holiday inns and hotels in Jim Corbett are available that can be booked for a good weekend stay. Jim Corbett is divided into 5 tourism zones namely, Dhikala, Jhirna, Bijrani, Sonanadi and Domunda all of which have rest houses available. However, the availability of the rooms is dependent upon the season. Staying overnight inside the park is recommended instead of booking a room in the main city. Being a part of vast expanse of flora, lighting a bonfire at night and experiencing the beauty of nature are things that cannot be missed. Luxurious hotels in Jim Corbett are Corbett River Creek Resort and Spa, Damy Royal Hotel, The Homestead at Corbett Country, Aranya Safari Resort, Corbett Mango Bloom and Tarika’s Jungal Park. The vast variety of flora and fauna is the main attraction here. Jim Corbett, one of the 9 tiger reserves in India is home to nearly three-fourths of the total Bengal Tigers in the country. Asiatic elephants, deer, wild boar and jackals are found in huge numbers inside the wildlife sanctuary. Some of the smaller residents of the park are Himalayan Palm Civet, Langur, Rhesus Monkey, Indian Gray Mongoose, Common Otter, Blacknaped Hare, Himalayan goral, Indian pangolins and Porcupine. Along the Ramganga River shores, one can spot the long-snouted, fish-eating Gharial Crocodile and the ‘Mugger’ Crocodile. The most celebrated fish in the region is Golden Mahseer. Also seen on the rocky hillsides is the Ghoral or Goat Antelopes. A rich assemblage of Sal forests, chaurs (grasslands), khair-sissoo forests can be seen. The most visible trees found in Corbett are Sal, Sissoo and Khair. Many other species that contribute to the diversity are found scattered throughout the park. Chir Pine is the only conifer here and is found on ridge-tops. The upper reaches near Kanda ridge have Oak growing, which is essentially a Himalayan species. Other major tree species are Bel, Kusum, Mahua, Bakli. Jeep Safari: Guests coming to Jim Corbett Park can book Jeep safari in Jim Corbett Park, in advance for morning or afternoon trips. Permits are issued starting 30 days in advance. Elephant Safari: The elephant rides are available for the guests coming to Jim Corbett Park. It is advisable to go during dawn instead of dusk since the wild animals may turn aggressive during the evening times. Fishing: Jim Corbett Park has 2 rivers, where guests can go for angling (catch-and-release). Permits can be obtained from director office, while staying at Wild Jungle Lodge at very nominal prices. Trekking: Trekking expeditions and backpacking tours in the Himalayas are organized periodically. Adventure Activities: Rock-climbing, rappelling, river-crossing and slithering is available. Parasailing, mountain biking are the sporting activities available in Jim Corbett. Camping activities during the night are also part of the bucket list here. Dhikuli: Situated at the fringes of Patli Dun valley, there is a rest house, built a hundred of years ago from where Kanda ridge forms the backdrop and one can enjoy the spectacular beauty of the valley. Kalagarh Dam: It is located in the south-west of the wildlife sanctuary and is one of the best places for a bird watching tour, especially the migratory waterfowl that comes during the winters. Corbett Falls: Located 25 km from Ramnagar on the Kaladhungi–Ramnagar highway, the falls is surrounded by dense forests and pin drop silence. Crocodile Pool, Dhikala Machaan, Getheryo Library (Dhikala), Corbett Museum (Dhangadi gate), Garjia Temple, Jim Corbett House are other attractions in the area. One can extend one’s trip to other nearby hill stations like Nainital (65 km), Ranikhet (95 km), Kausani and Mukteswar as well. Walking or trekking inside the park is strictly prohibited. Avoid perfumes and bright clothes, wear clothes of colour which merge with the natural surroundings. Carry a litter bag while entering the reserve and bring back non-biodegradable litter. Don’t talk loudly inside, nor smoke inside the forest. Do not collect plants or pluck flowers. While taking photographs or shooting videos, do not disturb the animals. Shouting, teasing or chasing animals or attempts to feed them are prohibited. The weather is extreme in Jim Corbett Park. Winters is a great time for bird-watching and tiger sighting while monsoons are a good time for walks and trekking. The best time to visit Corbett Park is between October till May end. The Jhirna Range and Sitabani Forests remain open round the year while the Bijrani and Dhikala Ranges open only from November till June each year. The stay at Jim Corbett Park depends on your interest and liking. Minimum suggested stay at Corbett Park is for 3 Days. If you get a Friday or a Monday off, you should pack your bags and not think twice before going to Jim Corbett. Book a cab to Jim Corbett and stay inside the forests to experience the beauty of nature. A stay in a tree house or a camp would be an experience of a lifetime. A conservative budget for a 3 day stay would be INR 4,000 but a comfortable estimate would be INR 6,000. So what are you waiting for? Book a cab for Jim Corbett and enjoy your stay there!! The crowing jewel of Garhwal Hills (Uttaranchal), Lansdowne is an exotic holiday destination for anyone who yearns for mental peace and rejuvenation. Placed at a height of 1,700 metres above sea level, this place got its name from Lord Lansdowne, an erstwhile Viceroy of India. Its salubrious weather and pristine environment make the city an ideal ‘Weekend Getaway’ spot for all Delhites. Located 260 kilometres north of New Delhi in the mountains of Uttarakhand, it takes just 7 hours to reach the city from the capital. It houses the headquarters of Garhwal Rifles, the eminent battalion of the Indian National Army. Endowed with a picturesque landscape, the city’s aura includes beautiful buildings, temples, museums and lakes. A perfect holiday destination for a ‘weekend quickie’, Lansdowne welcomes all its visitors with open arms and promises a visit to remember. Trains: There is no direct train from New Delhi to Lansdowne. However, 2 trains leaving from Old Delhi Railway Station (namely Mussorie Express n Garhwal Express) take you to Kotdwar – a place 41 kilometres from Lansdowne. Beyond this place, you would have to book a cab to Lansdowne. Shared cabs for Lansdowne are also available. We would recommend going by Garhwal Express since it runs in the morning. Throughout its route, the train cuts through the gigantic mountains making it a treat for the eyes. 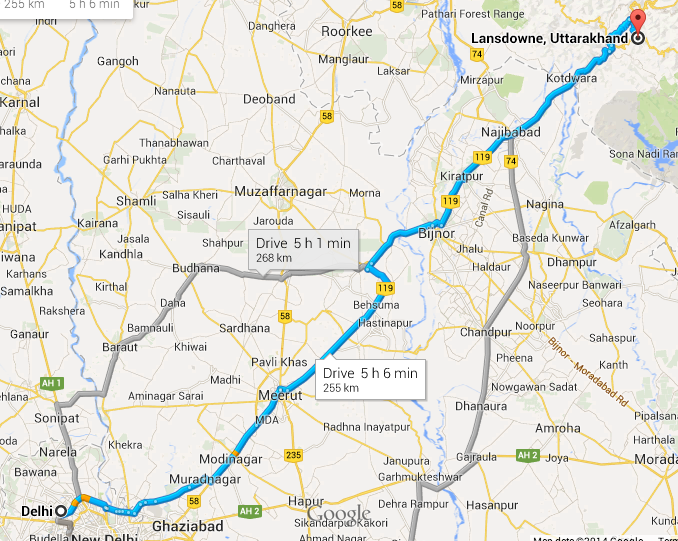 Buses: Travelling by road from Delhi to Lansdowne is much more convenient than by train. Private non-A/c and Volvo buses are available in plenty to travel from Delhi to Kotdwar. They leave from ISBT at a frequency of 3 hours every day. Flight: Lansdowne does not have an airport and Dehradun is the nearest airport connecting to Delhi. From the airport, taxis and cabs for Lansdowne are available costing about INR 2,000. Budget Hotels: Ajanta Guest House, Lans View, Shri Gobind Highway Motel, Vinayak Resorts are the hotels in Lansdowne where you can stay for under INR 1,000 per night. Mid-Range Hotels: Hotels in Lansdowne charging a tariff in range of INR 1,500 – 2,000 per night include Forest Palace, GMVN Lansdowne, Jadali Guest House, Shantiraj Resorts, The Oak Grave, Mayur Cottage. The ambience of these places is good, especially that of Forest Palace. Classy Hotels: These are places that would ensure you have a stay to remember. Excellent service quality and food, amidst great locales, the tariff charged here would be in excess of INR 2,500 per night. These include Le Osh Hotel, Blue Pine Resort, The Garhwali Inn, Bright Sunny Pines Resort, Kasang Regency Resort, Lans Castle. Out of these we recommend Lans Castle for its hospitality! Lansdowne is endowed with a natural beauty with its plush landscape and exotic terrain. It also houses some man-made architectural marvels that leave you intrigued. War Memorial: Located at Parade Ground, this is a tribute to the indomitable spirit of renowned regiment, Garhwal Rifles. Darwan Singh Museum: Consists of photographs of army, patriots in various wars, certificates and citations signed by the royalty, old uniforms, guns, real medals and weapons. Garhwali Mess: Built in Jan 1888, it is one of the oldest buildings in Lansdowne and an integral part of the city’s heritage. Tarkeshwar Mahadev Temple: A secluded temple amidst lush green forests of deodar trees, it is a magnificent sight to feel the calmness and enjoy nature free of urbanisation! Tip-n-Top Point: It is the highest point of Lansdowne and the view of the Joshimath’s snow clad mountains from there is amazing; best time to go is early morning! Bhim Pakora: Cute place that has a stone which moves with thumb force but not on pushing by hand. Word of caution: the 2 km road from the main market to the place is badL! Bhulla Tal Lake: Boating in the lake early morning refreshes and recharges you. You’ll get to see a lot of different birds in the vicinity. The nursery alongside the lake is good for buying different medicinal plants too. Try to walk down from Tip n Top hill to this lake! Camping in Lansdowne is possibleJ. Get your tents along and enjoy the night with a bonfire and soothing music. However, camping needs military’s permission. It is allowed in the Tarkeshwar Temple area after seeking permission from the temple priest. But the threat of wild animals including bears, boars and leopards is imminent. Trekking at Lansdowne is easier than other hill stations since the stretches are not that steep. Also, there is a small nursery run by Garhwal regiment; you may buy plants from here! In case you have time, there are places along the Delhi-Lansdowne route that are worth visiting! Rudraprayag: A popular tourist and pilgrim site, it is 121 km from Lansdowne. Haridwar: About 112 km from Lansdowne, it is one of the seven holiest cities of India. Rishikesh: Renowned for its adventure sports like rafting, it is located at 129 km from Lansdowne. Pauri: A quiet hill-station famous for its calm climate and green cover, it is 57 km from Lansdowne. Gandhi Chowk area is the place to have our lunch or dinner. Momos of Hotel Zayaka and the gigantic Aloo parantha of Hotel Mayur are must haves. The ideal season to visit the city is during the summers. April – September would be the peak with majority of the crowd coming from nearby cities like Delhi, NCR, Chandigarh and Dehradun. The weather is pleasant and the calm breezes would act as a tranquilizer from the hectic city life. 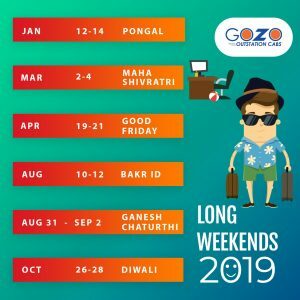 As India approaches the dawn of a new government coming into power, we at Gozocabs also have something to cheer about. We recently received our 4000th Booking which marks a new milestone in our eventful journey. Within a span of nearly 18 months we have catered to a plethora of customers always keeping giving paramount importance to their preferences and priorities. And it has been one hell of a journey. In hindsight, it is probably fair to say that our goal of making a difference in the society is what prompted us to take the leap and quit of well cushioned MNC jobs. Currently, what we are feeling is exemplified by the age old adage – ‘With great power, comes great responsibility’. We have a responsibility towards our existing stakeholders’ as well new members of the Gozo Community who keep joining us at various points throughout journey. We feel we’ve taken steps in the right direction and although there are ‘Miles to go before we sleep’, we are glad to have come this far! Our earnest endeavors would be to expand our operations from 17 cities currently to 50 cities by the end of this year. We would require your support for the same and an opportunity to serve you.